Following on from our popular review of the best mops for tile, we’ve had a number of requests for our verdict on the best hardwood floor cleaners currently available… and we’re only too happy to oblige! We’ve chosen and reviewed the 6 best hardwood floor mops for 2019 to make your buying decision easier. Our list ranges from old-school mops, for those that enjoy a hands-on approach, to a gentle and effective hardwood scrubber and also steam mops that sanitize away germs. Our reviews cover mops from some of the top, trusted brands including Bissel, Shark, Bona and O-Cedar. Which mop style or styles are right for your cleaning methods? That’s what we cover in our What’s Your Mop Type guide in the middle of this article. Each has its pros and cons, which you’ll find in the full reviews below along with feature details, price ranges and most helpful user reviews. We start with the List, move to the Overview for quick buying tips and finally to the Detailed Reviews for those that like to gather more information before deciding. This overview is ideal for those that want quick buying tips about what the mop does and why it is the best in its class. They say that to be the best you have to beat the best. Well, no steam mop has done that, so the PowerFresh remains on top. Did you know? There’s a PowerFresh Deluxe. But does deluxe mean better? While the two models are very closely rated, we chose to stick with the original. See our reasoning in the expanded review below to see if you agree! Here’s why the PowerFresh is the best steam mop for hardwood flooring. Steam in 3 settings: The options allow you to customize your cleaning to the level of grime your fighting. 99%: It kills virtually all bacteria and virus germs that might be lurking below. And it does it without chemical agents that are harsh on your floors and pet paws and bad for the air in your home. It’s free standing: One of the biggest complaints about steam mops including Shark steamers is that they do not stand up without leaning against something. This one won’t fall over and break or dent the drywall. There are several quality non-powered microfiber mops for hardwood, but the Turbo Microfiber hardwood mop has the best blend of rugged durability, cleaning versatility and ease of use. Did you know? While powered cleaners are growing in popularity, a non-powered microfiber mop is still America’s favorite way to clean hardwood flooring. Many owners of steam and scrubbing mops also have a manual mop for quick cleanups. Here’s the quick overview. The full Turbo microfiber mop review is below. Professional grade: In some cases, calling a tool “professional” is just marketing. 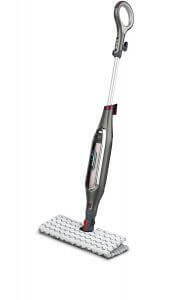 But the lightweight and strong aluminum construction with metal head and thick pads make this a pro-quality mop. 2 pad types – and 2 of each: The 4 mop heads include 2 standard microfiber pads and 2 scrubbing pads. Start with a scrubbing pad for stuck on dirt, then go over the entire surface with a standard pad. And then throw them in the wash, if needed, and they’re good as new. Length and maneuverability: Total length is 60 inches. There are a few that go to 70” – but see our pros and cons of a longer handle in the full review. The 360-degree head allows easier cleaning between, under and around obstacles. There’s plenty to like about the Spinwave, and a few drawbacks compared with the top two hardwood mops on our list. It has two spinning heads that rotate in opposite direction, the only tool of its type fit on our list. If your floors are moderately to highly soiled when you clean them, this might be your best mop choice for hardwood floors. Two pad options: The soft touch pads are designed for hardwood, though they’ll clean any hard flooring. The scrubby pads are OK for well-sealed wood and ideal for dirty tile and concrete. Large water tank: The 28oz tank, nearly a quart, allows you to do one to three rooms depending on how much water you use per room. On-demand spray: You control how much water is sprayed. You won’t waste it on lightly dirty floors or risk damage to hardwood with too much water, but you’ll have all the water you need for tough dirt. In a high-tech world, sometimes the tried-and-true does the job. 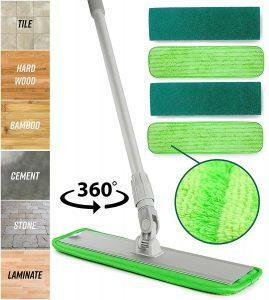 The EasyWring mop puts you in complete control of how wet the head is and how much pressure you apply to dirty floors. That makes it ideal for hardwood and laminate using a well-wrung mop and for tile, concrete and vinyl using a wetter mop. Tough dependability: The spin mechanism is heavy duty, and so is the mop handle. You’ll get years of hard work out of this O-Cedar mop system. Wringing the mop is simple: In fact, it’s hands-free. Put the mop in the wringer, and step on the pedal. Done. Plush microfiber: The mophead soaks up more dirty water and is long-lasting. If it ever wears out, affordable replacements are available. Bona has a century of hardwood flooring care under its belt. This is the only mop in the list designed specifically for wood floors. It’s manual. Many users like the ability to apply the right amount of pressure – light for most areas and a bit more “elbow grease” where dirt needs to be loosened. Did you know? There’s good news for allergy sufferers and green living enthusiasts. The new Bona Free & Simple Hardwood Floor Cleaner is Greenguard Gold certified to be low in VOCs and other harmful agents. It should be used from the spray bottle, not poured into the cleaner cartridge. This is an affordable hardwood mop with a sizeable 17” head that swivels for getting in and between things. The mop covers are microfiber. Light and low to the ground: At about 5lbs, the mop is easy to carry and won’t wear you out. The low-profile head fits under cabinets and furniture. Flexible baseplate corners won’t scratch furniture: The corners are made from a soft, rubbery material for nick-free cleaning. Bona cleaner is best: While you can use other cleaning solutions, Bona Hardwood formula works best. First, it is designed for wood floors. Secondly, it has the right thickness to spray evenly without clogging the sprayer. This best-selling vacuum brand makes a very good steam pocket mop too. However, it’s the priciest mop on the list. Channeled steam: Distribution channels in the head ensure that edges get the steam treatment. Three steam levels: Light cleaning can be accomplished on Low. Use Medium or High for harder-to-clean messes. Hands-free mophead removal: Nobody likes handling wet and dirty mopheads. You don’t have to with this innovative design. With “Touch-free Technology,” just press the Pad Release button, and the pad falls into the washer or laundry basket. 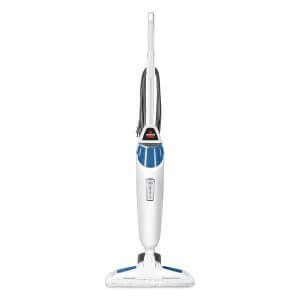 Steam Blaster: Spending extra on the Shark steam mop compared with the Bissell PowerFresh gets you this unique technology. A blast of steam from the front of the head helps loosen stuck yuck. It’s nice for blasting dingy grout lines too. Note: One of the videos shows a separate non-corded handle with spray cleaner bottle. These items are not included in this version of the product. See the full Shark Genius steam mop review below. What’s Your Hardwood Mop Type? This guide explains each, how they work and their pros and cons. It will help you decide which mop best fits the way you want to clean your hardwood floors. Like many homeowners, you might decide that having two or more mop types allows you to match your cleaning tool to how dirty your floors are. The O-Cedar EasyWring microfiber and Turbo microfiber are the two mops on the list that can be used wet, dry or with spray cleaner. In short, they are versatile. 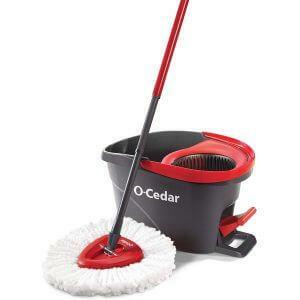 Pros: The O-Cedar mop is affordable and ideal for wet mopping dirt that is moderate to heavy. Wet the mop, mop the floor, rinse the mop and repeat. Change the water as needed. A wet mop picks up the dirt. Sometimes a spray mop just spreads it around, especially fine and heavy dirt. Used dry, the microfiber mophead on either mop picks up hair and fur, dust and lighter debris. Heavy debris like sand and fine dirt can be swept into a dust pan. These manual mops work great with your favorite hardwood flooring spray cleaner too, but there’s no built-in sprayer. Cons: You supply the labor, unlike the Bissell SpinWave that scrubs the floor with electric-powered heads. There’s no sanitizing heat as you get with the two steam mops listed. If you want to sanitize the floors, you’ll have to use a chemical sanitizer with a manual mop, and many of us are steering clear of those harsh cleaners. The Bona Hardwood Floor Spray Mop Premium makes our list for the cleaning ability of a quality mop that is easy to use with proven cleaning formula. It’s the best of several closely matched spray mops for you to consider. Pros: This is an affordable cleaning tool, and it puts a nice polish on hardwood floors. Floors that are new and clean don’t need a shine enhancer, but older, worn floors definitely sparkle brighter when a cleaning formula is used instead of plain water. Your two options are dry-mop and spray mop cleaning. Dry-mopping with the microfiber head is effective on floors lightly soiled by pet hair and dust. Use the built-in spray cleaner for floors with more dirt and stuck-on messes. The spray function built into the mop is much more convenient than carrying around a spray bottle of cleaner, since you’ll want both hands to direct the mop. Bona hardwood cleaners are oxygenated for environmentally safe and effective cleaning that won’t harm hardwood. Cons: The mop isn’t designed for wet cleaning, and there is no powered scrubbing or steam. The Bissell Spinwave is the powered scrubber on the list, but there are a few other (inferior) options in this class. It’s a unique design, but has significant pros and cons to consider. Pros: This corded machine does the work for you. The two powered scrubbing heads provide deep cleaning with hot water or a cleaning solution of your choosing. The solution can be something simple like water and white vinegar or a product formulated with the right surfactants for hardwood floor cleaning. Cons: This is a one-dimensional tool. It scrubs and loosens tough messes, but doesn’t pick them up very well. Many owners of the Spinwave and similar mops follow up the scrubbing with traditional mopping with the O-Cedar EasyWring or similar mop. 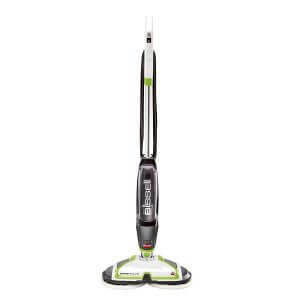 The Bissell PowerFresh and Shark Genius steam mop rise above a crowded field. Steam mops are popular because homeowners appreciate sanitizing power in an age of “super-bugs” when an ounce of prevention is worth a pound of cure. Pros: You can be sure that if any virus or bacteria can be killed with high-temperature steam, it will be killed with the 99.99% effective rate of these machines. The heat is also useful in loosening dried-on dirt, food spills and other nasty messes. If you don’t mind the weight, this is a versatile cleaner. Use it dry or with spray for basic cleaning. Save steam power for more demanding cleaning and sanitizing. Pocket power: The Shark Genius is a pocket mop, and that’s worth noting here for its convenience. With every other mop in the list, you will eventually have to handle a dirty mop head. Not so with a pocket mop. Plastic tabs on the head of the mop fit securely but effortlessly into pockets on the mophead when you lay it on the floor. The mophead releases just as easily with the push of a button as you hold it over the washer or a laundry basket. Cons: Excessive moisture is the nemesis of wood, and steam cleaners are all about penetrating, hot moisture (see Hardwood Horrors below). The cost of a steam mop is higher than prices for most other hardwood mop options. It has a microfiber head that can be used for dry cleaning and spray cleaning. But if that’s your cleaning style, a non-powered microfiber mop is more affordable and lighter too. For the Home Flooring Pros guide to the best steam mops currently on the market click here. The only risk-free, safe and effective mop for hardwood flooring is a dry microfiber mop. But that doesn’t leave you much cleaning power beyond picking up stray pet fur and dust. To clean dirty hardwood, you’ll need to take smart risks – enough cleaning power to do the job, but not too much to damage the wood. These tips will allow you to keep your hardwood floors clean while protecting them from aggressive cleaning damage. Keep a solid seal: Make sure the seal on your hardwood floors is in good condition. Re-sealing the floors can be done without refinishing them. The price of sealing is cheap compared with refinishing or replacing water-damaged floors. Properly sealed floors can be cleaned with any of the hardwood floor mop types with precautions listed below. Be gentle: In addition to making hardwood a shoes-free zone and padding all chair/furniture feet, you should clean with an easy touch. Do most of your cleaning with a microfiber mop that is dry, wet but well-wrung or used with spray cleaner formulated for wood. Use steam in moderation: Steam is hot and penetrating. Overuse of steam can cause the seal to flake away, especially where the wood is scratched and moisture can get beneath it. Lost sealer leaves the flooring susceptible to moisture absorption that results in water spots, swelling, buckling and costly repairs. Power scrubbing scrubs the seal too: Most hardwood floor sealers are NOT formulated with any kind of scrubbing in mind. Scrubbing is a great way to remove stubborn dirt, but with aggressive cleaning, the seal can be worn away and the wood can be scratched. Both put the wood at risk for damage. We recommend reserving power scrubbing for periodic deep cleaning. All the mops on the list are top performers in their categories. It comes down to deciding which technique you prefer using to get your hardwood flooring clean. Here are our Home Flooring Pros in-depth reviews detailing specifications and pros & cons that should make your purchase decision easier. This mop is a proven winner. More than 12,000 users have voiced their opinion by reviewing it over more than five years. The PowerFresh consistently gets high marks. That says two things: It cleans thoroughly, and it is durable. The PowerFresh Deluxe was mentioned above. We chose the original over the Deluxe for two reasons. First, the Deluxe only has two steam settings, high and low, and more options are better. Secondly, the original has a removable fill tank, so it can be filled in the sink where overfills are no problem. The Deluxe tank isn’t removable, but Bissell includes a fill pitcher. However, when you’re working on hardwood flooring, water spills are something to avoid. Other than those issues, the Deluxe offers two improvements. The power cord is longer at 25’. Secondly, you can easily remove the steam head by pushing a lever with your foot to allow use of the SpotBoost brush. The advantage over the original PowerFresh steam mop is that you can then apply the necessary force to remove stuck-on dirt. Review them both to decide which has the options you prefer. Three steam settings. The Low setting is ideal for lightly soiled floors. Plus, it gives you longer cleaning times between fills, and it uses less energy. Bump it up to Medium if it’s been a little longer than usual between mopping sessions. High is great for traffic areas, under the table where kids sit and leave-your-shoes-by-the-door areas. For hardwood, Low and Medium are the best settings. High might put too much moisture down on a hardwood floor. The Flip-down Easy Scrubber is simple to use, but doesn’t apply much downward force to remove stuck stuff. The most effective approach is to go over tough spots with High steam and allow the moisture to soften the mess before mopping it up. User satisfaction is 78% to 83%. About 14% of reviews are critical. Very reasonable cost for a steam cleaner – less than $100. Costs more than a Swiffer, but the long-term cost is lower since you don’t have to keep buying supplies. The included microfiber pad should last 30-60 cleanings. Heats up very quick and ready to go in less than one minute. Not using cleaner reduces cost and indoor air pollution. Dries quickly, so there’s less risk to wood. Be careful when pressing the flip-down scrubber – it’s possible to contact the steam with your foot, and it is hot. This is not a tool to use with bare feet. You’ll get better results if you sweep or vacuum up loose dirt, pet hair and other debris before steam cleaning your hardwood flooring. You want sanitizing steam. It effectively protects small children, the elderly and pets from potential bacteria, viruses, mold and mildew. What’s included: Corded steam mop, microfiber pad, scrubber pad, carpet glider, 2 Spring Breeze fabric discs. Bissell scent waters are an optional accessory. Hardwood and grout must be sealed and in good condition. The steam will penetrate hardwood if it isn’t sealed or if the sealant has worn away. It might soften unsealed grout. If you have older wood or tile flooring, it’s a good idea to make sure it has a fresh seal. Refreshes, but doesn’t clean, carpet. The Carpet Glider tool is installed on the bottom of the steam mop and engages the carpet. The mop head is held less than an inch off the carpet, so steam and the scent from discs can reach the carpet to freshen it. Be cautious about using High steam or lingering too long. You don’t want to soak your carpeting. Backed by a 2-year warranty. Be sure to register your warranty. It might come in handy, as a small percentage of PowerFresh mops fail during the warranty period. Value is a top trait to look for in a microfiber mop. Value does not mean cheap. It means that you get good quality and performance for a reasonable price. And that’s what you get with the microfiber mop from Turbo Mops. You’ll save loads of money too in the years ahead with reusable pads compared with disposables like Swiffer refills. Standard and Scrubbing pads. The standard pads are thick and durable, capable of enduring 75+ washes without starting to come apart. The looped fibers are long enough to catch and trap a significant amount of dirt, hair and other debris. There are 10,000 loops per pad. The scrubber pads are tough enough to loosen stubborn dirt, but they won’t damage delicate hardwood and laminate. Both pad types attach easily and securely to the Velcro on the mop head. About 2% of the mops ship with misaligned holes for attaching the head to the handle. If you’re one of the unlucky few, you’ll have two options. Return the mop to Amazon, a “no-hassle” return that’s still a hassle. Or you can do what a few have done and re-drill the hole to align it. That will void the warranty, but it seems to work. Ratings are 88% to 92% positive – that’s exceptional when 85% and above is considered among the best. Negative ratings are just 7% to 9%, also among the lowest number for all wood floor mops. Wash the mop heads before the first use or a little green dye might come off or some microfiber fuzz might be left behind. Improved from earlier versions – now with the 360-degree head. Light but sturdy aluminum handle. More ecofriendly and economical than using disposable pads. Removing embedded hair from the microfiber pads helps them get cleaner in the wash. Warm water with a little white vinegar in a spray bottle is perfect for dirty spots. A light cleaning solution works too, but might leave streaks behind unless it is formulated for wood. Professional house cleaners use and recommend it. Pads are thick, so hold enough water to clean heavily soiled flooring (though be cautious about using a lot of water on hardwood and laminate). Affordable enough to have two – one fitted with standard pad and the other fitted with the scrubbing pad – so there’s no need to stop and switch pads in the middle of cleaning. The handle sometimes unscrews while cleaning, but this can be remedied by tightening it before starting or applying a little Loctite to the threads for a permanent fix. You are concerned your hardwood flooring is too fragile for steam or a powered scrubber, or your hardwood installer warned against using them. Steamers and scrubbers at 6+ pounds are too heavy to be comfortable for you to use. There are a few more notes on this mop. All-surface cleaning from floor to ceiling: This tool is more versatile than steam cleaners and powered scrubbers. They both clean all floor types, but the Turbo microfiber mop is so easy to use on walls and upper corners. The lighter weight makes it ideal for stairs. Other brand pads work: Turbo’s pads are great, but if you have another favorite brand, they might work. Turbo Mops says these brands fit: Swifter Wet Jet, Libman, Bissell, O-Cedar, Bona, Shark and Rubbermaid. If you need replacement pads, both microfiber and scrubbing pads are available on Amazon. 60” vs 70”: Real Clean and a few other mops have a telescoping 70” handle. The benefit is a little longer/higher reach, helpful under king beds and getting cobwebs in corners of 10-foot ceilings. The downside is that the longer handle is more prone to breaking, especially when exerting significant pressure on it. Guarantee: The company offers a “No Question, Full Money Back Guarantee” if you aren’t happy with it for any reason including breakage. The Spinwave’s two powered spin heads are driven with a 0.9 amp motor, powerful enough for adequate scrubbing without damaging hardwood. The heads can be fitted with “soft touch” pads or scrubby pads depending on the level of dirt you’re fighting. The pads go on and off easily and are washable. Scrubbing action. It does the work, so you don’t have to. Time. The mop should be moved slowly over the floor surface for best results. If you move it too quickly, the scrubbing heads drag over the floor instead of doing their job. 83% to 86% of ratings are favorable. About 10% of users wouldn’t buy it again. Took less than two minutes to assemble. Easy to use with just 2 buttons – On/Off and Spray. The weight of the tool is just right for applying adequate downward pressure for best cleaning. Glides across the floor, but you’ll have to hold it back a little to scrub away tough dirt. Won’t pick up large particles, so you might have to vacuum or broom floors as needed. A little like the Swiffer Wet Jet, but larger and more powerful. Cleans better. Reusable pads save money over the disposable Wet Jet pads, but washing them isn’t as convenient as tossing them. Spray out too much liquid, and the pads won’t absorb it all. Keep a rag handy for those times. Head won’t fit in tight spaces like behind the toilet. Like having a mini floor buffer. No polish needed. Windex and white vinegar solution used for streak free cleaning. Bissell Multi Surface solution and Bona solution work well too. May leave swirl marks behind on some surfaces, even when proper solution is used. A little bit heavy to lug around. You need a tool for moderate to heavy cleaning plus buffing a nice shine onto your hardwood and other hard flooring. In the box: Spinwave, 8oz. formula, 2 soft touch and 2 scrubby pads. We’ll complete our Bissell Spinwave review with a few further comments. Low-profile head: The head is less than 4 inches tall, so it fits beneath cabinet fronts and furniture. However, the tool doesn’t lay very flat, so you can’t reach more than 6-8 inches beneath furniture. Floors should be sealed: Hardwood is sealed at the factory or when installed or refinished. However, with time, the seal wears off. This machine should only be used on floors with a seal in good condition to avoid hardwood floor stains and damage. Might be a weight issue: The 9.5lbs is a bit heavy compared with the 1.45lbs of the Turbo Microfiber and the 6lbs of the PowerFresh and other steam cleaners. Most of the weight is in the head, so when it is running, it feels light. It’s when carrying the unit that you’ll notice the weight. Pet solution: Bissell makes a multi surface solution for homes with pets that helps deodorize. It works well in the Spinwave. This mop is much easier to use than those that require hand wringing. Some even say it’s fun! The price is right for this mop too. We’re fans of the triangle mophead that gets deep into corners and swivels a nice 360 degrees for more cleaning with less moving on your part. However, it’s only about 12” wide, so a narrower than rectangular microfiber heads. Foot-pedal wringing is ideal for anyone with arthritis in their hands or arms. Plus, it really hums, so dirty water and debris is spun out of it. When you get familiar with the wringer, you will be able to customize how wet the mophead is for each floor type. Overfilling the bucket can cause water to spray out onto you and the floor. The kit includes a splash guard that helps. Maximum fill should be about half the bucket. This might cause you to change the water more often. Positive ratings are 81% to 84% of all users. About 12% of ratings are negative. Most negative comments are about the foot pedal breaking. Stepping on it gently but firmly should reduce early failure. Well designed – an upgrade from the previous model. Cuts cleaning time in half compared with a traditional mop. Picks up larger particles than other microfiber heads. Putting undue stress on it might cause the handle to break. Used by pro house cleaners who give it high ratings. Mop head is smaller than the head on an old-style string mop. May leave streaks on laminate, so if you want a “perfect” shine, use this mop first and then go over the floor with Windex and a dry microfiber mop. Easy to move mop into corners and under furniture. If you’re over 6’-4” tall, the handle seems a bit short. The handle has three segments, but one might get stuck, making you think it only has two pieces. This will make it shorter than it should be. You like the control a traditional water mop gives you and don’t want to spend the money for a steamer or scrubber. In the box: Handle, head, mop cover. Weight: 4lbs for the mop and bucket combined. Mop weighs less than 2lbs. Mop height: Telescoping from 24 inches to 51 inches with mop head included. Mop head sizes: Triangle approximately 11.5 inches on all sides. Here are a few more thoughts on the O-Cedar EasyWring microfiber spin mop. Not just hardwood: The Easy Wring mop works very well on wood, tile and other resilient flooring. Keep the water content of the mophead light to moderate for use on wood floors. No spare heads: Many microfiber mops come with 2-4 heads. Replacement mop heads are available at a reasonable price. Dry works too: Using the mop dry is great for dusting blinds and light fixtures and getting cobwebs out of corners. This hardwood flooring mop makes the list for its affordability, ease of use and the highly rated Bona wood cleaner. Not everyone thinks this is a great hardwood cleaner though, so let’s explore a little deeper. Redesigned spray mechanism. This unit replaces the Bona WM710013348 spray mop that had a cheap spray mechanism that broke on many of mops. The reviews for this Bona are lower than expected because people are really reviewing the old model on this product page, not realizing it’s a different model. Long story short, the sprayer on this model is improved. A much lower percentage of users report that the new model sprayer stops working or leaks. Leaking. While the sprayer has been improved, too many of the new models leak when not in use. And leaking might stain hardwood when not discovered immediately. This can be solved by taking out the cartridge between uses. We strongly recommend doing this rather than risking a leak and a stain. Positive ratings are 70% to 73%, a number that should rise with the redesigned sprayer. Negative ratings are more than 20% due to the issues we’ve discussed. Here are the reviews that will help you decide whether this unit is for you. The Premium mop [this one] is improved over the old Bona hardwood spray mop. A+ for the new design. Feels like better construction than the old one. While improved, putting too much pressure on the head might eventually cause it to break. 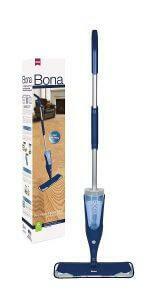 No streaks or clouding when using Bona wood floor cleaner. The built-in spray cartridge is easier to use than carrying around a spray bottle while trying to mop floors. The washable covers are easy and environmentally friendlier than disposables. You like the performance of Bona wood floor cleaner and would like a compatible mop. At this price, it’s a low-risk purchase. And remember, remove the cartridge between mopping sessions to eliminate the risk of leaks. Interchangeable cartridges with Bona Stone/Tile cleaner: The solution cartridge is easy to remove, fill and insert again. If you also have a Bona stone/tile/laminate mop, the cartridges between the two are interchangeable. Retractable handle hook: The hook makes it very easy to hang the mop up and out of the way. Genuine Bona replacement microfiber covers: There are “compatible” covers available for less money, but most don’t fit like original equipment. We recommend sticking with the Bona replacements. Like most SharkNinja products, the Shark Genius design demonstrates attention to detail and next-level technology. You pay more, but it delivers more too. The machine’s positive ratings are much higher than average. 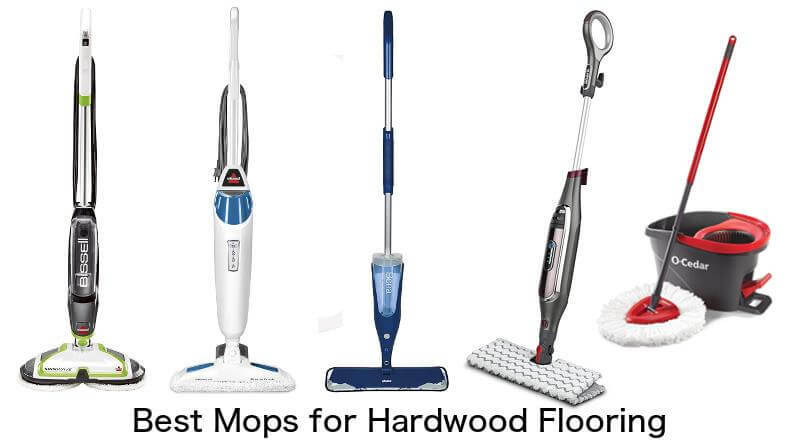 It has an average number of negative ratings compared to the other hardwood mops in this list, but keep reading for the odd cause of many negative reviews and how to avoid it. Steam Blaster. A dose of steam in the right spot quickly loosens dried juice, dirt and other grime. Hit grout lines with it too. You’ll go through your tank of water faster when using the Blaster a lot, but that’s a small hassle to get enhanced cleaning power. Saves you from stooping and scrubbing too. Just use the Steam Blaster judiciously. If you’re overdoing it, and the head can’t pick up all the water on wood, use a rag to wipe it dry. Here’s the reason for many negative reviews. A few buyers have received what appears to be a knock-off or a used item, often in a white box with little branding, rather than a genuine new SharkNinja product. Many of these machines break quickly. Amazon says, “Note: Available at a lower price from other sellers…” AVOID sellers you know nothing about! Positive reviews are 82% to 86%. Negatives are about 10%, but quite a few of them involve the fake or refurbished machines mentioned as the Biggest Concern above. Price is a bit high, but the cost is repaid in less than a year compared with using disposable Swiffer types. Tired of mopping with soon-dirty water, so tried this and love it. Quiet, so doesn’t wake sleeping babies. Water tank isn’t removable, a minor hassle to fill in a sink or with the cup included. Having three steam levels is awesome. You have to unplug the mop to turn it off. No On/Off switch. Once you learn the technique, dumping off dirty heads is easy and you don’t have to touch them. Tank seems smaller than older models, and you go through more water with the blaster. Won’t stand on its own. For dirty grout, spray on grout cleaner and let it sit. Then steam clean it. Got dog urine stains off this way. If your tap water is hard, use distilled water or you might get streaking on floors. Swivel head is easy to maneuver and lays mostly flat for cleaning under stuff. But it swivels a little too easy, moving side to side when trying to mop straight. Got the Shark Triangle scrubber and pad – perfect for the bathroom and dirty tile anywhere. Remove wet pads when done mopping, or they can stain or even get moldy. You want one kit that has a powerful steam cleaner and a non-powered spray cleaner. Weight: 6lbs with steamer; about 2.5lbs as a spray mop. What’s included: Corded steam mop, head with Steam Blaster, 1 pad, fill flask. Extra pads are available. Three steam settings: Like the PowerFresh, this unit has three levels of steam that are easily adjusted for targeted cleaning. No-touch pad On/Off: Lay the pad on the floor, place the mop on it, and push down. The four tabs on the head slide into the pockets on the pad. When done mopping, lift the mop over a laundry basket or the clothes washer, push the Release button, and the pad falls off. This video shows how easy it is. Try the Triangle on tile: Like many Shark products, this one is sold in a couple versions. The model reviewed here does not include the Triangle Scrubber Head that works with steam and the Steam Blaster. It’s an affordable accessory that is ideal for dirty tile and working in the bathroom where an angled head gets into tight corners.